Topes everywhere today! Those speed bumps are not fun! So many people had warned us about them, but it’s not until you experience the full horror of bumping endlessly up and down them through villages, hour upon hour that you realise just how awful they are. They come with very little warning, and are often in the shade of trees so you can’t quite see them. Our journey was only to be 134 miles today, but Google Maps had a suggested time of 4 hours 50 minutes. 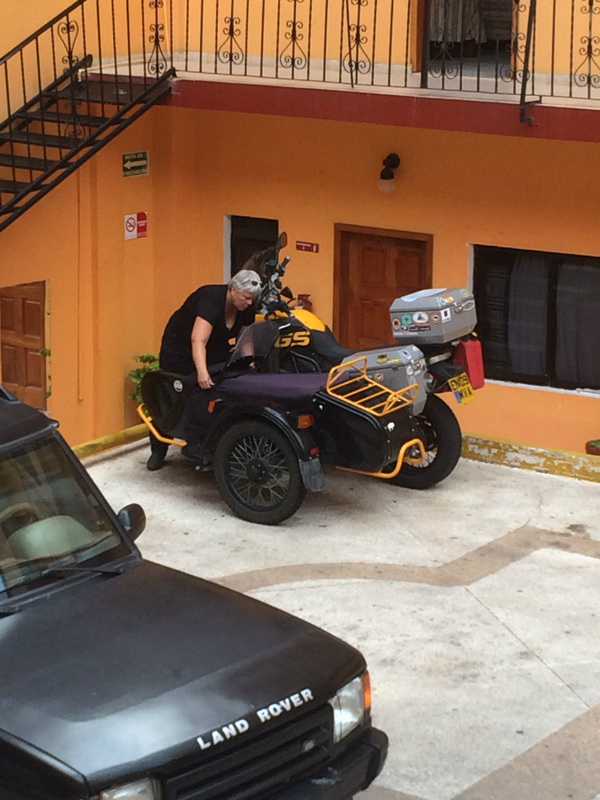 So we knew we were in for a bumpy ride………… Leaving the hotel at Palenque, we were immediately into tight and twisty corners, but Paul was taking it slowly, to make it as comfortable as possible for us, the bike, and our tyres. After about 10 km, we came to the first of the roadworks. These work in a similar (ish) way to the many roadworks we came across on the Alaska Highway, in that there is only one route, so you must wait patiently, whilst work is done, before being allowed through. On the first of these stops they were actually putting down a foundation of sand, then moving it into place to make the road, that we were then allowed to drive on. Once again, not a lot of Health and Safety there. The rest of the day took us through lush green landscape, as we rose much higher, away for the time being from the tropical landscape, and about 10 degrees celsius cooler than we’ve been used to for the last few weeks. We ran through a lot of villages, where each one is like a hazard perception test, there may be donkeys, dogs, chickens, goats, horses, children, people walking, cyclists anywhere within a few miles radius of each village. They could be at any point on the road, a blind bend, in the middle, wherever suits them. These are all interspersed with large potholes in the road and the occasional landslide. Maintenance of the road for these villages certainly does not seem like a priority. We also came across a string tied from one side of the road to the other, which is raised by a person standing at the side of the road. This is to make you stop, and have a look what they have for sale. 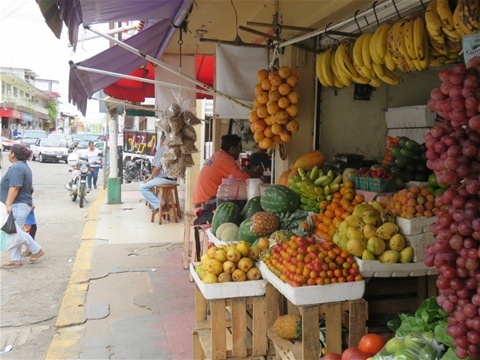 This could be tortillas, bananas, mangos, tomatoes, something they have grown or made to sell. At one point today, we actually came across a homemade road block made from logs. There were about 5 teenagers there, who asked for money to let you past. We had heard about this before, but it was our first experience of it. I handed over 12 pesos (40p), and they duly let us through. The locals appeared to all pay as well. We will have a look round the town of Comitan shortly before heading into Guatemala tomorrow. Final note of the day: When Paul put his hand is his jacket pocket for his tyre pressure guage today he found .............. a tv remote control he stole from somewhere! We left Acayucan yesterday morning, to quite humid conditions and an overcast sky. 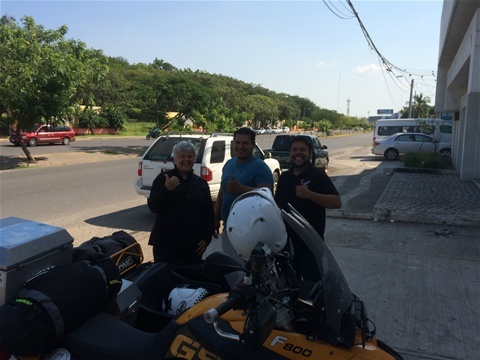 We had noticed that the roads in veracruz were not as good, when we rode in on Thursday, but had only been on a few. Yesterday’s ride proved to us that all the roads were full of potholes, despite them being toll roads, we were quite surprised by this, but perhaps Veracruz just doesn’t receive as much government funding- we had seen a few banners around the town, which seemed to be making political statements in Acayucan. About an hour into the ride, the sky was becoming blacker, and as we had just passed a toll booth, Paul pulled in for a quick break. As we turned into the petrol station, we rode through a puddle, which brought a great bow wave up over the side of the sidecar and into coat me with water. We stopped, I got out and then the heavens really opened! I scrambled to get back in and we rode off, as it’s always our idea to outride the rain. This was perhaps not the best plan, in amongst those potholes, it made very difficult riding for Paul, and it as like someone was continually throwing buckets of water over me! After the rain though the sun shone through, and we rode the rest of the way to Palenque. This morning we got up early to try to arrive at Palenque early to beat the heat and crowds- but the weather had other ideas, and it was pouring. Once it had cleared we set off, it wasn’t far, 5 miles, through some very pretty jungle scenery. Palenque was every bit as stunning as we had imagined. It is a UNESCO world heritage site. 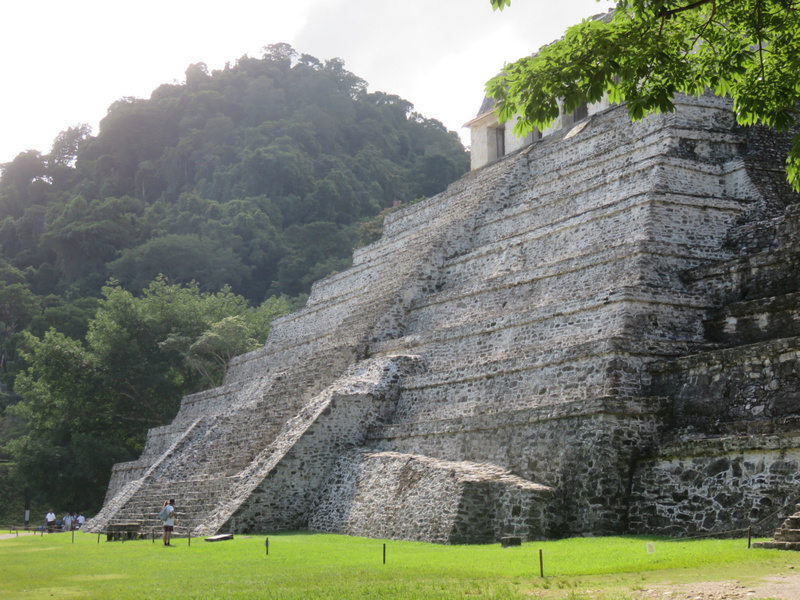 It was a Maya city state in southern Mexico that flourished in the 7th century. The Palenque ruins date from 226 BC to AD 799. After the Mayans stopped using it, it was absorbed into the jungle of cedar, mahogany, and sapodilla trees, but has since been excavated and restored and is now a famous archaeological site attracting thousands of visitors. Another amazing day in Mexico. We decided to stay for another night in what we had thought was a tiny colonial town. It turns out to have a population of 50,000. The streets of the town are laid out on a grid system, as in the USA, but here they teem with life. As we walked around the town square and surrounds earlier, we were astounded by the shops that almost run one into the other, selling their wares right up to the pavement’s edge. All brightly coloured, and playing music so loud, it’s a riot of sound. In amongst this, you hear the sound of the police sirens (just used to make a way through the very busy traffic I think), plus tiny little vans or ape’s with huge megaphones attached to the top, all competing with each other to be the loudest, to draw attention to what they are selling. There were also street vendors selling bags, balloons, wooden crafted items, rugs, blankets, belts, cut fruit, coconut drinks, peeled peanuts, shelled peanuts, doughnuts, cakes and one man tried to sell us a plant he had ‘invented’. The square could easily fit thousands of people into it, it is raised up and very attractive, surrounded by the trees, which are filled with those nosy little bird (active again as I write). We will move on tomorrow, we are nearing the border with every day. It is humid again today, we are returning to tropical lands, in stark contrast to the chilly snow capped mountain we saw yesterday. Leaving Morelia yesterday morning was really cold! Only 13 degrees celsius, as we waved goodbye to the owners of the ‘cabin’ we had stayed in the night before. To be fair, it was fairly upmarket for a cabin, and probably the nicest place we have stayed so far in Mexico. As there wasn’t breakfast provided, we decided to head on to the motorway, and get some at the services. Just a quick shoot through the town, or so we thought, ¾ hour later, we were still fighting our way through the traffic. The town was overrun with police, all armed, directing traffic around what looked set to be a very large demonstration, or maybe political conference, perhaps. We are far more used to the police presence now, but are still amazed that there seem to be at least 4 policemen per 1 citizen! Eventually we came out the other side, and bombed along the motorway to the first services. Whilst there, we met a guy who was very interested in what we were doing. He was with his family, and made his wife drop everything and take his photograph with us, before going into the shop. Whilst he was in the shop, I looked up to see him just gazing out of the window at us with a complete look of awe on his face. When I returned from the loo, he was outside again chatting away with Paul, and really excited. I don’t think he’d ever come across such fools before! Later, at another stop, and after another loo run, I came out to find another woman sitting in my sidecar! Apparently, the couple had spotted us when filling their bike with petrol and rushed straight over to ask Paul if they could sit in and on it, to have their photos taken, so of course he obliged. Last night we stopped in another Pueblo Magico, Cholula, a very pretty little town that we enjoyed having a look around. Today was another cold start, followed by a good clear ride of 270 miles to the very lovely town of Acayacan. The town square opposite our hotel is alive with roosting birds, and as I type the noise is so loud we can hear it above the air conditioning. We may stop for an extra day tomorrow, we’ll see what the morning brings. We left this morning, in search of a Honda shop, in the hopes of buying replacement inner tubes and having the tube that went down yesterday patched if we could, although we had struggled to find the hole in it. We wanted to set off with two new and the patched inner tube if possible. So away we rode from last night’s lovely little hotel, which had been extremely secure with locked gates, but it also had barbed wire around the top of the walls, hmmm, as the nearest restaurant was 10 blocks walk away, we opted for the safer option of having a take-away ordered in for us. Yesterday had been a very long and hot day, and we had already begun to question whether to carry on with our route along the coast. 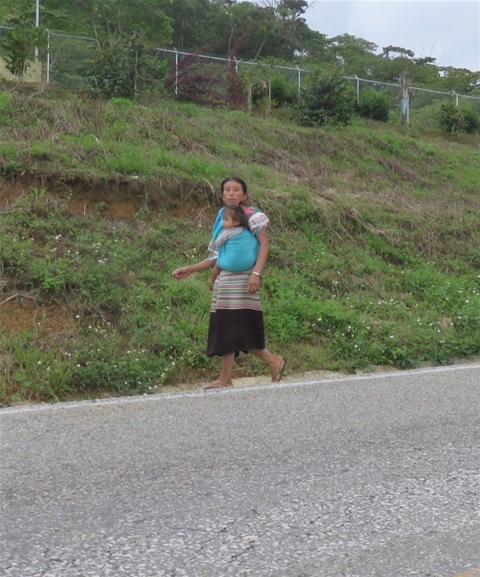 The road conditions were becoming quite bad in places, and the Mexican ‘Topes’ (speed bumps) on the way into and out of each town are completely over the top. There can be up to 12 in and 12 out, and alot of them are in very poor condition. Perhaps though, on top of the second puncture in four days, another deciding factor to change our route was the marked increase in police and military presence, all looking very fierce with their guns prominently on display. They clearly have a problem in this state that they didn’t seem to have further up the coast. It makes for an uneasy feeling. This helped fuel our decision to take the faster toll roads for a while, meaning a turn inland. We found the Honda shop after a minor detour courtesy of Google maps, and the mechanic there Roberto could not have been more helpful. He nipped off on his little scooter around the town for puncture repair (he found the puncture hole), and two separate places for inner tubes. What a star. About 11.30 am we set off along the toll roads, which still were lined with beautiful scenery, and as we moved inland we left behind the tropical weather for arid desert, which finally gave way to a very chilly feeling 20 degrees at our stop tonight. The town of Morelia, which is surrounded by mountains. We are both looking forward to an excellent and much cooler night's sleep tonight.